Iron Man fans, wait until you get a load of these. Yes Anime is in attendance at NYCC 2013 and have a full assortment of the Play Imaginative Super Alloy Iron Man Armor Suits on display. The detail found in each piece is simply stunning. I won’t ruin the surprise by letting you know all the different armor types shown, but Peace Maker, Python and the Iron Man Mark X suit are there, just to name a few. 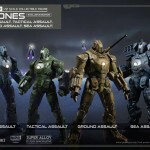 Just as stunning are the Iron Man 2 Hammer Industries Mechs, including the Ground, Air, Sea and Tactical Assault Types. These 1/4 & 1/12 scale works of art come with interchangeable pieces, such has hands, face plates to replicate damage, the works. Although not all offerings will have the same extras, each figure will have gear tailored to that specific character and it’s functionality. Pretty cool, huh? Although these are initial display prototypes, they are close to final as these beautiful pieces will be available in 2014. We hope you enjoy the extensive gallery of over 100 images that we’ve collected for your viewing pleasure. Play Imaginative revealed some photos of an upcoming assortment of 1/12 Scale Super Alloy Iron Man 2 Drones. They are calling these an Exclusive Edition, however, no other info was made available. There are four drones in total. We will post more info as it becomes available. You can see the photos of the Super Alloy Drones after the jump. Art Asylum has posted two new updates for their Iron Man 2 Minimates. 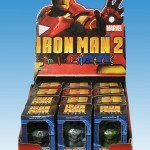 Included are a new set of counter-display Minimates as well as some new Iron Man 2 exclusives.